The best park in Torrance? For the rocket ship and incredible city and ocean view, we say yes. Holy hidden gem alert, Batman! Now, you may be asking, Stuff in LA, are you really featuring some random LA park on your website? Is this really worthy of my previous, precious time? Well, first of all, we agree. Life is short. But come on, lighten up, dude. We're kind of sick of people getting upset over silly stuff on the internet. But, we digress. Let's go over why Rocketship Park is very worthy of your time—both in reading this article and in actually going and visiting this one of a kind place. Firstly, if you're a kid, think you're a kid, wish you were still a kid, or have kids, then you'll absolutely love the playground here. The swings just bring us back to a nicer time when all we cared about is whether to get the Teenage Mutant Ninja Turtle popsicle or the Spongebob (or other relevant cartoon character of your era) popsicle. Secondly, THIS PLACE HAS AN INCREDIBLE VIEW. You can see it all: Palos Verdes, LA, the beautiful Pacific Ocean...We're getting chills just thinking about this FREE vantage point. Life pro tip: views make for fantastic date spots! We mean, come on. Los Angeles, as beautiful as it is, isn't know for really high vantage points—except maybe Griffith Observatory. The thing is that Rocketship Park is so cool because it's in a nice chill Torrance neighborhood. None of the crazy fuss about parking or driving up a hill that you get with Griffith. Oh, wait. 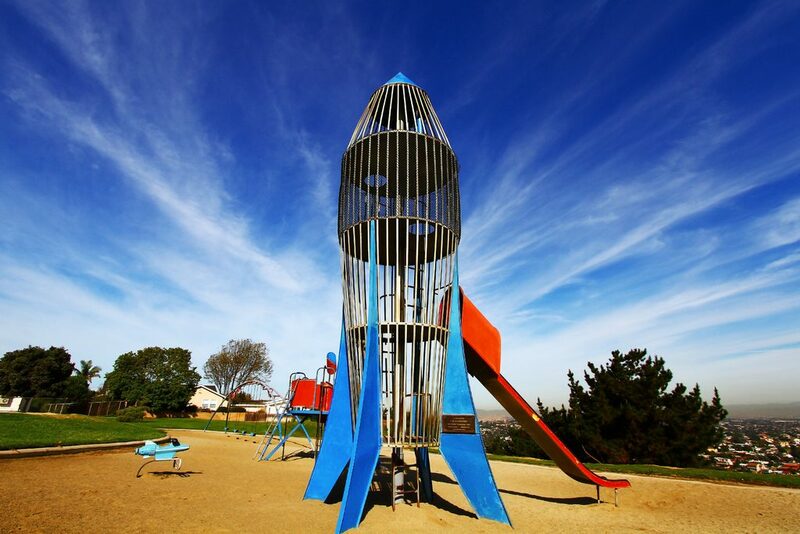 Let us get to the real awesome part of Rocketship Park: THE ROCKET SHIP! Isn't that awesome!! The average age here at Stuff in LA is 67 (may or may not be a joke), and even we want to get in that thing and play around. Just look at that kid—he's having the time of his young life. So is she! She's not even looking at the rocket ship, but just being in its presence brings out the purest expression of joy we have ever seen. Rocketship Park is such a cool place, and it's very nostalgic for many, many LA visitors and residents. It's time to make memories there so you can be one of them.